To read Mr Aliyev’s acceptance letter in full click here. 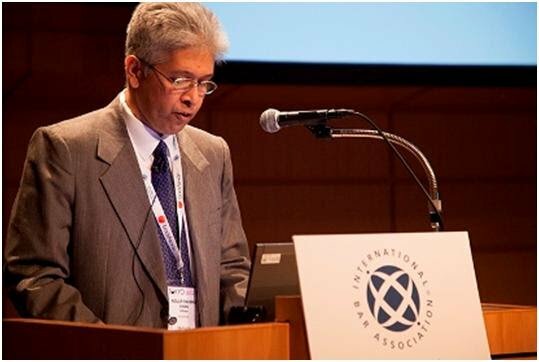 Bangladesh human rights defender Adilur Rahman Khan, of the human rights organisation Odhikar, has won the 2014 International Bar Association (IBA) Human Rights Award. Earlier this year he received the Robert F. Kennedy human rights award [http://rfkcenter.org/bangladeshi-human-rights-attorney-adilur-rahman-khan-selected-for-31st-annual-robert-f-kennedy-human-rights-award ] and was one of 3 final nominees for the Martin Ennals Award [https://thoolen.wordpress.com/2014/06/22/announcement-ceremony-of-the-martin-ennals-award-2014-on-7-october/]. For more on these awards see: http://www.brandsaviors.com/thedigest/awards. Adilur received the award from IBA President Michael Reynolds at the Rule of Law Symposium held at the conclusion of the IBA Annual Conference in Tokyo, which finished on 24 October. In October 1994, he founded the human rights organisation Odhikar, which has undertaken extensive fact-finding and reporting of human rights violations in Bangladesh. During the presentation of the award, Reynolds said, “Let us be reminded that lawyers play a vital role in promoting justice, human rights and upholding the rule of law, both at home and abroad. May Mr Khan’s courage, determination and resilience be an inspiration to lawyers everywhere.”In his acceptance speech, Adilur told the 200 delegates gathered at the Symposium, ‘The Rule of Law is under serious threat in my country. Justice for all the ongoing gross human rights violations is inaccessible for victims and their families. Their right to access to complaint mechanisms is denied, regardless of whatever is written in the laws or the Constitution of the country”. Repressive laws are in force and the independence of the judiciary is under attack in a spree of politicisation of institutions of the state, he added. via Adilur gets IBA int’l human rights award. Iranian lawyer and human rights defender Abdolfattah Soltani recevied on 5 October the 2012International Bar AssociationHuman Rights Award. The announcement came during the International Bar Association (IBA) Annual Conference taking place in Dublin, Ireland. Mr Soltani, who co-founded the Defenders of Human Rights Centre (DHRC) with Nobel Peace Prize winner Ms Shirin Ebadi, has worked courageously and determinedly throughout his career to provide pro bono legal counsel to those in need. As a result of his human rights defence work, Mr Soltani has endured persistent persecution from the Iranian government and has been imprisoned on several occasions. He is currently serving a 13-year prison sentence in Iran that stems from a number of charges including co-founding the DHRC, spreading anti-government propaganda and endangering national security. The imprisonment began on 4 March 2012. Zahra Kazemi, a Canadian-Iranian journalist arrested for taking photographs in front of Evin prison in July 2003. Ms Kazemi died in the same prison several days later. In addition, Mr Soltani has defended teachers, protesters, other fellow human rights lawyers, political activists, students, and several Baha’I (Iranian minority group) leaders. In many instances other lawyers refused to take on these cases because of the risks involved. Iran Abdolfattah Soltani awarded with IBA Human Rights Award Lawyers for Lawyers.